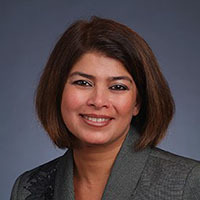 Swati Abbott leads the efforts of Blue Health Intelligence to leverage data insights into innovative analytics solutions. This strategy includes extending the company’s reach to external audiences, while enhancing BHI’s value to Blue Cross and Blue Shield companies. Prior to joining BHI, Abbott served as President of Elsevier/MEDai, an industry leader in predictive analytics, where she provided leadership and strategic vision to position the company at the forefront of the healthcare industry. Before MEDai, Abbott was Managing Director for the Medical Management Strategic Business Unit at ViPS, where she led strategic solutions development for medical management data warehousing and HEDIS reporting for healthcare payer clients. Abbott was also involved in leading SoftMed Systems, Inc. to create and provide solutions for hospitals and integrated delivery networks in the key areas of medical chart abstraction, quality assurance, utilization management, risk management and regulatory reporting. As a respected industry leader, Abbott is a regular speaker at industry conferences, presenting on topics related to predictive modeling, medical home and healthcare clinical analytics. She is also a contributor and member of the editorial board for Predictive Modeling magazine and has been quoted in notable industry publications regarding the use and future of predictive analytics, the state of healthcare analytics and quality improvement initiatives. In 2010, Frost and Sullivan recognized Abbott as one of the Movers and Shakers in healthcare. Abbott holds a Bachelor of Science in physics from Delhi University, India.